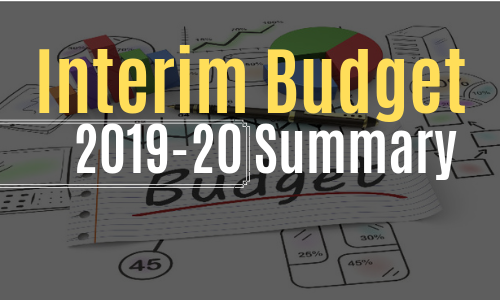 Interim Budget 2019-20 was presented by the Union Minister for Finance, Corporate Affairs, Railways & Coal, Shri Piyush Goyal in Parliament. Fiscal Deficit Target for has been revised to 3.4% of Gross Domestic Product (GDP) from 3.3% of GDP estimated earlier. Fiscal Deficit Target for FY20 has been fixed at 3.4% of GDP. The upward revision in fiscal deficit is primarily attributed to the allocation of Rs. 20,000 crores and Rs. 75,000 crores, in FY19 and FY20 respectively, for providing assured income support to the farmers under a new initiative- ‘Pradhan Mantri KIsan SAmman Nidhi (PM-KISAN) programme. Excluding this, the fiscal deficit would have been less than 3.3% for FY19 and less than 3.1% for FY20. The target of 3% of fiscal deficit to be achieved by FY21. The Fiscal Responsibility and Budget Management (FRBM) Act has recommended that the Debt to GDP ratio of the government should be reduced to 40% by FY25, which stood at 46.5% in FY18. The disinvestment target set at Rs. 80,000 crores for FY19. Existing rates of income tax to continue for FY19-20. Full tax rebate for individual taxpayers having taxable annual income up to Rs. 5 lakhs. Standard Deduction raised from the current Rs. 40,000 to Rs. 50,000 for salaried persons. ax Deducted at Source (TDS) threshold on interest earned on bank/post office deposits raised from Rs. 10,000 to Rs. 40,000. Exemption of income tax on notional rent on a second self-occupied house. TDS threshold for deduction of tax on rent is proposed to be increased from Rs. 1,80,000 to Rs. 2,40,000. The benefit of rollover of capital gains under section 54 of the Income Tax Act will be increased from investment in one residential house to two residential houses for a tax payer having capital gains up to Rs. 2 crores. This benefit can be availed once in a life time. Long term capital gains arising from the sale of residential property will now be eligible for investment in two houses. Under affordable housing, the benefits under Section 80-IBA of the Income Tax Act has been extended for one more year, i.e. to the housing projects approved till 31st March, 2020. The government has proposed to extend the period of exemption from levy of tax on notional rent, on unsold inventories, from one year to two years, from the end of the year in which the project is completed. The government has proposed that stamp duties would levied on one instrument relating to one transaction and get collected at one place through the Stock Exchanges. The duty will be shared with the state governments on the basis of domicile of buying client. The Insolvency and Bankruptcy Code has helped in recovery of non-performing loans of Rs. 3 lakh crores. Recapitalization has been done with an investment of Rs. 2.6 lakh crores. The Government e-Marketplace (GeM) platform will be extended to all Central Public Sector Enterprises (CPSEs). Department of Industrial Policy and Promotion to be renamed as the Department for Promotion of Industries and Internal Trade. Under PM-KISAN programme, vulnerable farmer families having cultivable land upto 2 hectares, will be provided direct income support of Rs. 6,000 per year. Minimum support price (MSP) of all 22 crops to be at least 50% more than the cost. Rs. 60,000 crores will be allocated for Mahatma Gandhi National Rural Employment Guarantee Scheme (MGNREGA). Rs. 19,000 crores in FY20 will be allocated under Pradhan Mantri Gram Sadak Yojana (PMGSY). In case of timely repayment of loans, the borrowers will get an additional 3% interest subvention. All farmers affected by severe natural calamities, where assistance is provided from National Disaster Relief Fund (NDRF), will be provided the benefit of interest subvention of 2% and prompt repayment incentive of 3% for the entire period of reschedulement of their loans. Government to make 1 lakh villages into Digital Villages over next five years. A mega pension yojana namely 'Pradhan Mantri Shram -Yogi Maandhan' is to be launched for the unorganized sector workers with monthly income upto Rs. 15,000. This pension yojana will provide an assured monthly pension of Rs. 3,000 from the age of 60 years on a monthly contribution of a small affordable amount during their working age. The government has allocated Rs. 500 crores for this Scheme. The government has propsed a National Programme on 'Artificial Intelligence' by the establishment of the National Centre on Artificial Intelligence.